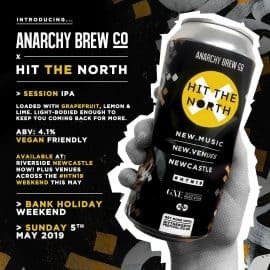 Anarchy X Hit The North - Anarchy Brew Co.
Stoked to be able to announce that we’ve teamed up with Hit The North! We’ve released the official beer for the #HTN19 festival this year. The beer, a 4.1% ABV session IPA, is available now from Riverside Newcastle. It’ll be on sale at selected Hit The North venues in Newcastle across the May Bank Holiday weekend. For more info on the Hit The North festival (or to book tickets), check out their website here.